Chromium, molybdenum and tungsten oxides supported on amorphous silica are catalysts for many reactions, including large-scale industrial processes. Although these systems have been extensively studied for many years, there are still a few unresolved issues, concerning mainly the nature of the active sites and mechanisms of their formation. Computational studies, using cluster or periodic models to represent the catalyst surface, are helpful in interpretation of spectroscopic data and can provide complementary information about the catalytic process. In this chapter, such computational works on CrOx/SiO2, MoOx/SiO2 and WOx/SiO2 systems are presented. It is seen that coordination environment of the transition metal, determined also by local surface properties, is a key factor influencing catalytic activity of the surface metal species. This results in complex structure–activity relationships. 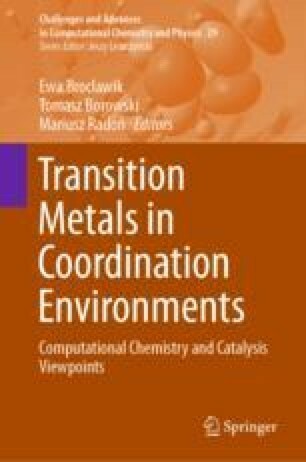 While a great progress has been achieved in modelling of these systems, from simple clusters to advanced periodic slabs, theoretical determination of complex reaction mechanisms using surface models with representative distribution of metal sites is still a challenge for computational catalysis.